Clone Trooper is an all-new figure. The historical first carded figure photo is inaccurate. 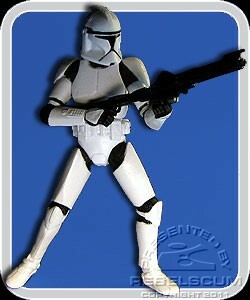 The first Clone Trooper action figure was actually a sneak preview figure in the Power of the Jedi line. Additionally, the carded white clone shown on the card was never actually released. The Saga Clone Trooper sported red flashes (marking him as a captain), which is shown in the insert photo. It is not yet known if this will be corrected.